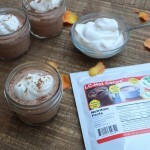 Simple, easy, delicious low carb chocolate mousse! Blend with a hand mixer on medium-high speed for 3-4 minutes, until mixture thickens and is no longer runny. As you are blending, taste and add more chocolate or sea salt as desired. You can make whipped cream with any extra heavy whipping cream you have. Blend in a separate bowl with vanilla and LC-Erythritol Granular Sweetener, to taste. Spoon mousse into individual serving bowls or mason jars, top with whipped cream and garnish with cocoa powder or cinnamon.